While getting a drink at the casino bar at Bally's with one of my girlfriends I mentioned to Jimmy the bartender that we were there to see "The Bronx Wanderers." Jimmy said emphatically "Oh you're going to love the show!" I believed him because bartenders know. At least the ones in Las Vegas do. They've seen a lot of acts come and go. If he'd just said "That's a popular show," or "Yeah they're nice guys," I know what that means and it's usually not great. Then a few couples seated around me joined in that they were also there to see the show; all for the second or third time. One guy said he'd seen them in Florida awhile ago before they were a Vegas act and came to town just to see them again. Later we were seated at Bally's Windows Showroom, a cabaret style theater, watching "The Bronx Wanderers." The charismatic Vinny Adinolfi, otherwise know as Yo' Vinny declares to the audience "I'm living the dream!" Then he announces the band recently celebrated their two year anniversary as a Las Vegas act. I get the feeling this show is based on the premise that audiences like to feel connected to the performers on stage by hearing about their lives, because that's what they do throughout the night. Vinny shares his life right from the start. He talks about his journey, first as a teenager wanting to get into show business; then with a low level job at a major label which eventually led to a long career as a successful music producer. After years of that he decided to follow another dream, one that included performing. He first recruited friends and then later his two sons who now form the core of the band. They played and toured for several years before landing a permanent home in Las Vegas. The production has been a hit with fans since it first came here and I think that is partly due to Vinny's history as a music producer. He knew what songs to include in their set lists, and what kind of vocalists and musicians were needed to create the sound and feel of "The Bronx Wanderers," which by the way is the name of the show and the band. He also made a show out of it and not just a concert of cover songs, which it could have ended up being without the storytelling and multimedia mixed in with the music. Their talent and skill is obvious early on in with a killer version of Walk Like A Man and a medley of Billy Joel songs. Then Vin A. owns as lead vocalist on Bohemian Rhapsody. I just saw Adam Lambert do that song with Queen last month and Vin A. is of the same caliber. He also crushes Brian Setzer's Rock This Town, (and I don't even like that song, but I loved his version). Oh and great touch with wardrobe on that one, white shoes and white and gold guitar. Other highlights include hits by artists John Fogerty and Bruno Mars. The vocals are only half of it as the musicians are fantastic in this show and are the show, as much as the vocalists. Vinny is a great band lead and host and also plays acoustic guitar. His son Vin A. is the music director, and vocals and keyboard. His other son Nicky Stix (who also performed in Jersey Boys), is as sharp as they come on drums and back up vocals. Joe Bari plays sax, guitar, keyboard, and background vocals. His powerful sax always seemed to come in just at the right time to add something special to certain songs. David Braun on lead guitar and backing vocals has the sound and the swagger, and Fernando Tort is top notch on bass guitar & backing vocals. Vinny also pays tribute to his wife who has sacrificed a lot for her husband and sons to be on the road all the time pursuing their dream and making music. Classy move to mention that, as it is too often overlooked, the partners behind the performers. He also says the current band are all former high school classmates of his sons. Vinny talks about his first trip to Vegas at 12 years of age, seeing Elvis perform, and how the seed of his musical career was planted that day and has now come full circle. This article only highlights some of the show, as there is so much more to it than I've mentioned here. This show runs nightly at Bally's Hotel & Casino, which means they work seven days a week, every week. Same guys, every day. Hope they don't burn themselves out. We're going to want them here for a very long time. 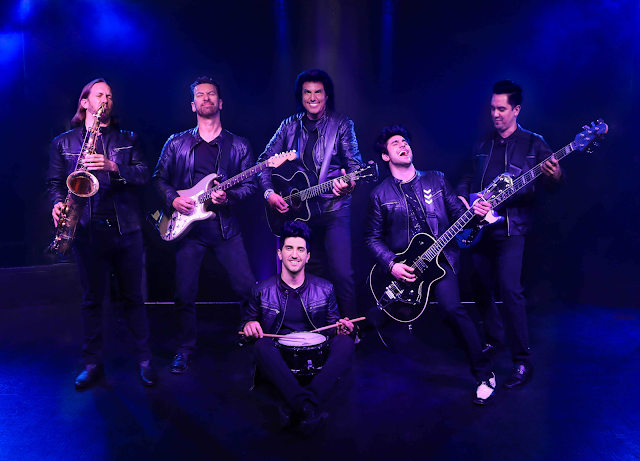 "The Bronx Wanderers" explode with talent, style and heart! Last week I attended a recurring musical event that has great word of mouth around town. 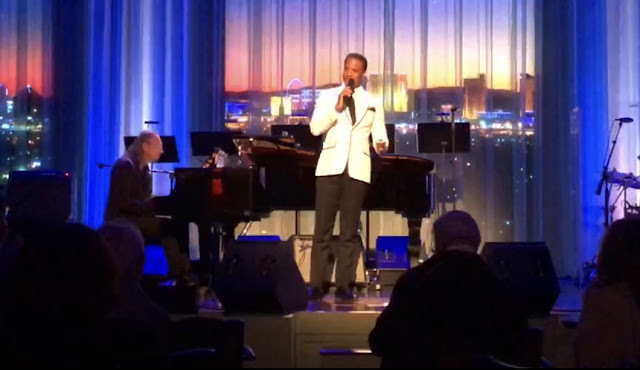 Run by composer Keith Thompson of PK Entertainment, "The Composer's Showcase" is the work of several composers, musicians and singers presenting their original work about once a month at Myron's Cabaret Jazz at the Smith Center. 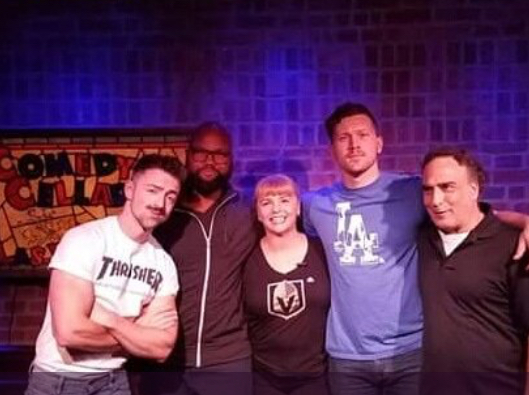 The show first began with a group of musical directors and composers working and living in Las Vegas who wanted to get together and showcase their own new music. That was 12 years ago and it's still going strong. Most are established composers and artists with an occasional up and comer in the mix. This is not an open mic style show but a planned and rehearsed production of a variety of original music. Composer Keith Thompson not only produces the event but is also the emcee. Keith opened last week's show with a lighthearted song that set the tone for a night of congenial entertainment. The other half of PK Entertainment, Philip Fortenberry joined some of the acts on piano, appearing and disappearing from the stage (like a brilliant musical ghost). After Keith was Dr. Mark Wherry who sang with some of his students from College of Southern Nevada. The song was called Financially Made and was a humorous reflection on the rigors of financial aid. His students sounded great and had fun attitude and character in their performance. Next up was Jordan Sanders who sang her original song Man in the Moon while playing guitar. Jordan is a student at Las Vegas Academy and her voice is enchanting. Jeff Leibow sat down at the piano and shared a meaningful song he wrote about the loss of a baby six years ago called Lost Soul. It was sorrowful and comforting at the same time because it had an uplifting message about lost souls ultimately finding their way home. It takes a lot for a performer to share something so personal and I think that means a lot to an audience. It did to me. After him one of my favorite composers Michelle Johnson sang a song she wrote on a bus while touring many years ago about a dead end relationship...I Don't Make Your Heart Sing. Spellbinding as always, I enjoy when Michelle shares some of her original music (like she did at her most recent show at Myron's this past summer). Michelle then had a surprise for us all and introduced Lousie Goffin who performed one of her songs, The Last Time I Saw my Sister, from her upcoming album "All These Hellos." Dennis Blair inspired chuckles with his comedic song It's Not A Good Idea, about a man who obviously does not think he should marry his girlfriend! This performance featured Joey Singer on piano. 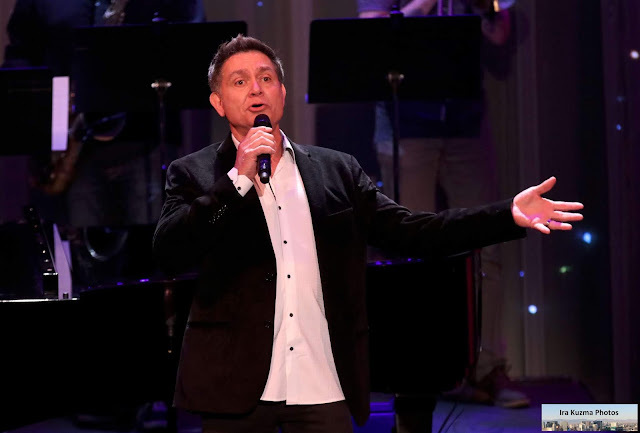 Although touted as a comedian, Dennis is also an excellent singer, as proven on his most recent album Hapless Romantic. A dynamic performance of his song Explode by Kyle Khou, was a hit with the crowd as well. Kyle was an American Idol finalist and has an album out titled "No Boxes." Focusing on the Halloween month that is October, Rylan Leo Helmuth debuted what I'll refer to as a spooky horror opera style song that I don't recall the name of but involved powerfully talented singers and a string section which added a haunting depth. I get scared easily so I had to busy myself with my Bento Box and cocktail, (Myron's serves food and drinks during shows). Then Matt Dorman introduced Betsy Holms who sang Empty House, a beautifully done version of a classic country song reminiscent of Tammy Wynette. Following her was Halsey Harkins who sat down at the piano and shared her song Technicolor Shades; which she said came to her after seeing someone desperately intoxicated, and the melancholy surrounding that moment. One of my favorites of the night was a song by Keith Thompson that he said he wrote years ago when going through an especially self reflective time. It's called I Am The Song, about meaning in life and spreading light. Philip Fortenberry was on piano and David Warner on what they referred to as a harp cello. I mentioned to Keith after the show how touching his song was and he said, "Thank you that was hard for me to do. I'm usually joking around and this song shows a more serious side of me." Closing the show was Elijah Rock. It was his first appearance at this event and he was rocking the white tux style jacket with black trim exceptionally well, not to mention his voice and vocal style! Accompanied by Uli Geissendoerfer he sang Matters of the Heart then New York in the Springtime. Elijah's new album is "Gershwin for My Soul." Elijah's motto, "Keeping Thine Eyes to the Future and Thy Ears to the Past," fits him well. I absolutely loved this production. With it's eclectic style, congenial feel and high caliber performances, "The Composer's Showcase" makes its own kind of magic. October 10 "The Composers Showcase", Dennis Blair, Matt Dorman, Uli Geissendoerfer, Louise Goffin, Halsey Harkins, Rylan Leo Helmuth, Marisa Johnson, Michelle Johnson, Kyle Khou, Jeff Leibow, Elijah Rock, Jordan Sanders, Ketih Thompson, Mark Wherry. The performers were Thomas Calvin, Sam Holder, Betsy Holms, Jenelle Magbutay, Gret Menzies, Karsten Pudwill, Coco Lane Rigbye, Jolana Sampson, Ashley Stone, Rachel Tyler. The show included some performers and musicians not mentioned here. "The Composer's Showcase" is now a Nevada nonprofit.